I love being outside. It's a great way to detox from “city life” as well as just a good time. You get to see lots of natural and beautiful sights you wouldn't see if you stayed inside all the time. You also put yourself at risk of bug bites, scratches, and stings. There's an amazing little herb that can help with those, and many other issues. Plantain. Not the banana that we often find fried up in Hispanic Cuisine. This plantain is commonly found all over the world. We even have a native one here, in Florida. 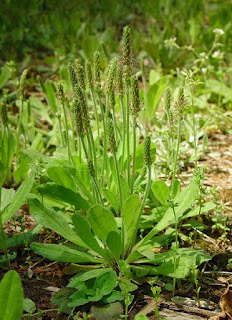 Plantago major, P. lanceolata, and P. virginica are all commonly found in the U.S. P. major is a broad-leaved species, commonly called Broad-leaved Plantain or Waybroad, that is not native to America, but was brought over by the European settlers. There's an old wives tale that attributes the discovery of this plant to Alexander the Great who then brought it with him to Europe in 327 BCE. However the Saxons and Norse considered it one of their 9 sacred herbs, given to them by Odin himself. 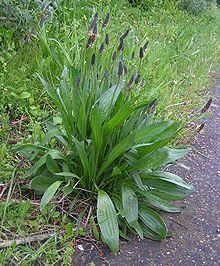 This species, as well as P. lanceolata, were nicknamed by the Native Americans as “Whiteman's foot” because it seemed like everywhere the Europeans settled, one of these plants would soon emerge. P. lanceolata is also not native to America, but it's a narrow-leaved species commonly known as English Plantain. P. virginica, was first “discovered” in Virginia, but it's native habitat extends throughout most of the South East portion of America. 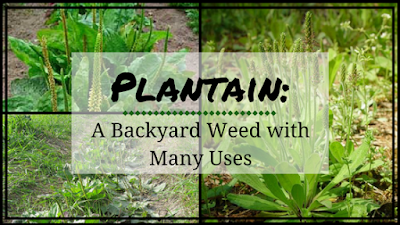 It's much smaller than either of it's European cousins, many people have a hard time believing that it's a plantain. All of the plantain species are both medicinal and edible, in fact they are all pretty much interchangeable in their uses. They're commonly found near trails, roads, sidewalks, and in meadows. Young leaves can be eaten raw and taste similar to Swiss chard. When the leaves mature, they get a little tough and are much more palatable when cooked. Summary of Actions- Refrigerant, diuretic, mildly astringent, useful as an anti-inflammatory, a vulnerary, and a mild styptic. Useful as a relaxing expectorant, to tonify mucus membranes, reduce phlegm, and as an alterative. Can be used as an antispasmodic and often used topically for healing. Traditional Chinese Medicine (TCM)- Plantain seeds, or Che Qian Zi, are used in TCM. They work best on the bladder, kidney, lung, and liver meridians. The leaves are slightly bitter, slightly salty, and acrid. The roots are slightly salty and slightly sweet. The seeds are sweet and cold. The seeds are most commonly used in TCM to drain damp, promote urination, regulate water, and clear heat. 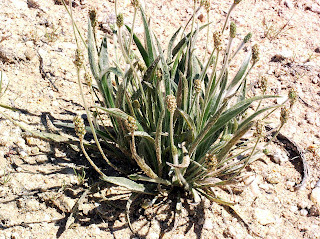 Ayurveda- Blond Psyllium, Plantago ovata, was introduced to India by the Arabs and has been seen in Persian and Arabic medical texts since at least the 10th century. In Ayurvedic medicine, plantain is used to improve bowel movements, both thickening them (in the case of diarrhea) and loosening them (for constipation). It is also used to relive problems associated with Irritable Bowels. It's also used to control blood sugar and cholesterol. 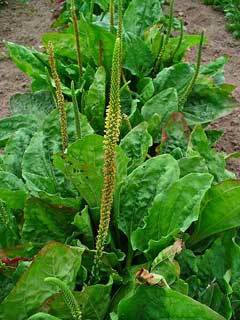 Nourishment- Plantain is packed full of nutrients such as vitamins A, C, and K, magnesium, calcium, and other minerals. The seeds are also packed full of protein. First Aid: Burns- Use a poultice of plantain, immediately after the burn, and bandage it. Change this dressing every 30 minutes. For minor burns, you only need to use the poultice once. Wash with a strong plantain tea (chilled if at all possible) in between dressing changes. After the burn has lost it's heat, remove the dressing, wash it, and apply a plantain salve to help speed the healing process, but don't apply the salve until the heat has dissipated. The oils used in the process of making a salve can seal in the heat and cause more damage to the deeper tissues. First Aid: Poison Ivy/Sumac/Oak- Apply a poultice immediately and bandage. Change the dressing every 30 minutes until the sting is gone. Wash with strong plantain tea or diluted tincture in between dressing changes. First Aid: Scratches, Cuts, and Scrapes- Stop bleeding by applying crushed plantain leaves. Wash with plantain tea or diluted tincture to help reduce inflammation and chances for infection. First Aid: Insect Stings/Bites- Apply a poultice, or crushed leaves, immediately and bandage. Remove bandage after sting dissipates. First Aid: Venomous Bites- Apply a poultice of the roots immediately, and bandage. Get to a hospital ASAP. If possible, capture or kill the animal in question so that the doctor can correctly identify the anti-venom needed. The plantain should help reduce the spread of the venom, but you still need to get an anti-venom from a hospital, just to be sure. Some people have reported amazing results when mixing plantain root with activated charcoal. However, venomous bites can be a seriously life-threatening situation so you should use the utmost caution and follow the advice of a doctor. Throat Pain and Infections- Gargle with strong plantain tea to help reduce throat pain and speed the healing of infections in the throat. Add a good measure of salt to help boost the effects. Respiratory Infections- Drinking warm plantain tea, sweetened with honey, helps to fight respiratory infections. You can also use the tincture for the same purpose. Liver, Kidney, and Bladder Function- Drinking 1-2 glasses of plantain tea on a daily basis can drastically improve liver, kidney, and bladder function. A stronger tea can be used to help fight infections. Skin Conditions- A tincture or salve made from plantain can be used to help kill the bacteria that cause boils and acne. It's also really good for the skin in general as it helps to speed the healing of any eczema, psoriasis, dandruff, etc. Panacea- A panacea is an all-purpose solution, or a cure-all. This herb certainly has been used for a wide enough variety of problems that it can be considered a panacea. I only included a basic introduction to this amazing herb. I hope you have learned a new appreciation for how amazing plantain is. If you have any questions or comments, please leave them below.